The word Bhuna is used to describe the process where spices are fried gently to bring out their flavors . The chicken bhuna curry that I've given the recipe of below is an extension to this cooking method. The Bite size chicken is essentially added to the spices and cooks in its own juice, resulting in a deliciously strong flavor , but not much sauce. The word Bhuna is used to describe the process where spices are fried gently to bring out their flavors . The chicken bhuna curry that I've given the recipe of below is an extension to this cooking method. Marinate the chicken pieces with yoghurt, ginger, turmeric, red chili, green chili, garam masala powder & salt. Keep aside the marinated chicken for 1-2hr. Now take a non-stick pan and heat the oil and ghee together. Add garlic paste to the oil and after 1-2 second immediately add the sliced onion. Don't burn the garlic. Fry the onion till golden and add the marinated chicken and put the heat on high. Lots of water will come out from the chicken. 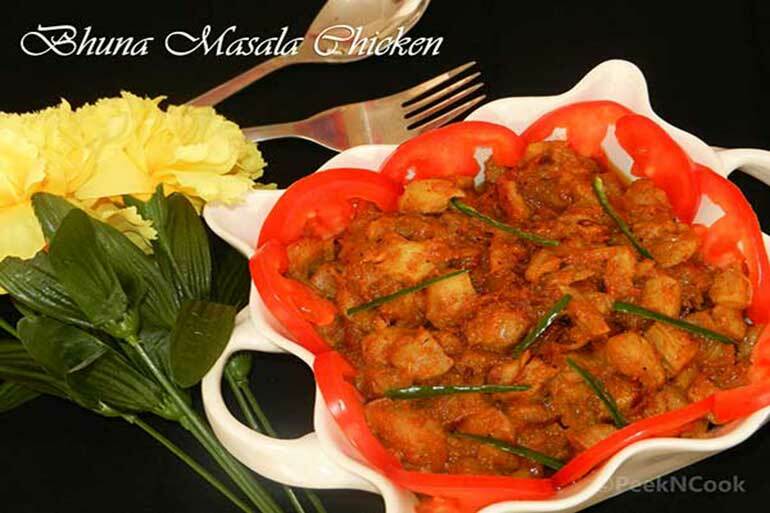 So keep stirring and evaporate all the water of the chicken till oil separates from the masala. When oil starts separating from masala off the heat and place the 'Bhuna Chicken' on a serving bowl and garnish it with sliced tomatoes and chilies. This dry chicken should serve with Lachha Paratha or Kulcha. You can add some lime juice on it.